Pepper, the fast-selling humanoid robot that reads your emotions, can apparently also wear lots of cute outfits and hairstyles, like some sort of eerie, automated, joke-telling Barbie. The robot, sold by Japanese telecom giant SoftBank and designed by French robotics firm Aldebaran, went on sale in Japan earlier this year, and keeps selling out within sixty seconds each time a new batch is released. Well, now, fans of Pepper are starting to come up with wigs, garb, and facial decals to personalise your Pepper with kimonos, Santa hats, and more. 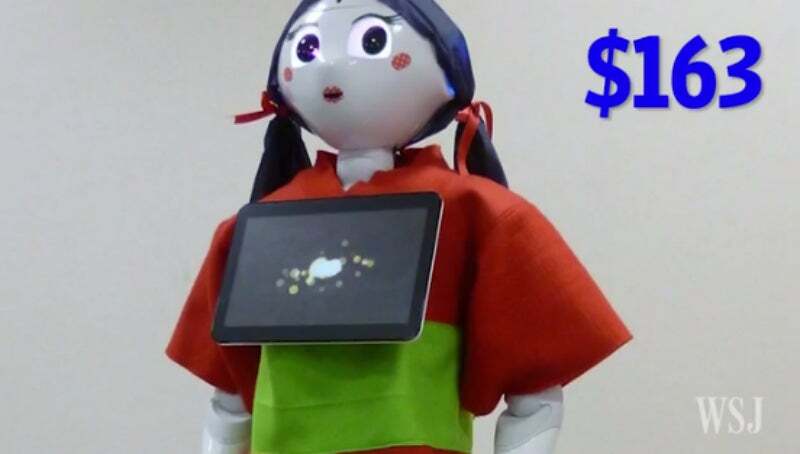 The Wall Street Journal reports that a 59-year-old man in Japan and a friend launched a website in August that specialises in Pepper clothing, which needs to be specially made so it to doesn't cover up or disrupt any of the robot's many sensors or gets caught in its joints. Unlike a lot of Western robots, which are designed to help us on the assembly line, Pepper is pretty typical of many Japanese 'bots that are made to live alongside humans and interact with them. There's already been hiccups, though: Pepper's been deemed too polite for Westerners, so its attitude will apparently be getting a sarcastic twist for Americans. And earlier this year, in its native Japan, a drunk guy was arrested for assaulting a Pepper in a SoftBank cell phone store. Pepper debuted in France last month, and should be arriving in North America in the coming months. It remains to be seen if Americans will dress them up like a G.I. Joe, beat them up, or simply shoot the breeze with them, the way their creators intended. Watch a video of more Peppers getting dressed up with accessories and clothes from the Etsy-like site for robots here.